You’re looking forward to cruising over the open road in your new 2017 Mercedes-Benz GLE 350. See how RBM of Alpharetta can help you upgrade your new luxury car for the perfect driving experience. When you opt for the mbrace® suite of packages, you’ll get services that complete your busy life in Alpharetta. The base services include remote access and in-vehicle navigation, and you can also enjoy wi-fi and streaming Internet radio. The Secure package adds crisis assist and crash notification, while the Concierge package adds route assistance around John’s Creek and beyond. In-vehicle infotainment gives you access to radio, while the speed alert, curfew minder, and driving journal are invaluable for those with teenage drivers. The $4,520 Active Curve system adds features to keep you safe and your handling smooth while you cruise, like an adaptive damping system for a serene ride. At $3,900, this package adds safety and driver awareness features like blind spot assist and lane keeping assist, as well as technology including Sirius XM radio, phone syncing, and in-vehicle navigation. This $6,190 upgraded package includes additional exterior and interior lighting, as well as heated and cooled cupholders in the front. Upgrade to this package for $9,080, and you’ll get a steering and distance pilot, as well as safety and driver awareness like active brake assist and a surround view system. At $2,900, AMG® body styling and AMG® 20-inch 5-spoke wheels accentuate the power and performance under the hood of your vehicle. Inside, brushed aluminum pedals and sporty interior designing accentuate the athletic front seats that cradle you going around sharp curves—all for just $350. This $1,290 package adds a parking assist system, along with surround view for your driver awareness. This $3,200 package adds all of the features of the Exterior Sport package, as well as gloss black wheels and exterior accents. 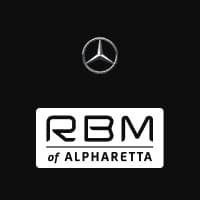 If you’re ready to get into your new 2017 Mercedes-Benz GLE 350, stop by RBM of Alpharetta today. Our knowledgeable and skilled sales staff will help you select the perfect model, and add the packages that will make your luxury car complete. To speak to our sales staff and schedule a test drive, call us today at 678-637-2333 or come see us at 345 McFarland Parkway in Alpharetta, GA.